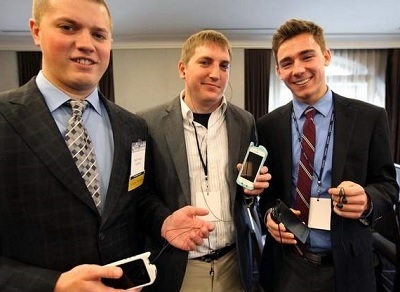 Phi Delt brothers Paul Schrems and Nick Turnbull joined with MSU grad Jeremy Lindlbauer and have founded Ann Arbor-based TurtleCell — company that began taking online orders for a $49.95 phone case that includes retractable earbuds. By the winter holidays, they expect to sell 100,000 of them in thousands of stores nationwide through a licensing agreement with an Auburn Hills distributor. The path to success, they said, started in 2011 as Schrems walked to his car. Who had his iPhone in one hand and had his tangled headphones in the other hand. He had the thought that you can put these two together and somehow put this tangled mess into the case where a battery usually sits. For about two years, he kept refining the case design — making it thinner, lighter and easier to use — until he had one that satisfied him. He used services available to him at the University of Michigan, such as 3D printing. 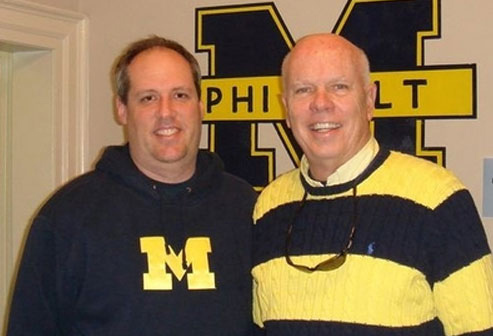 At the same time, he and Turnbull, also a U-M engineering student, created a company. To enter the contests, they had to form a business plan. As they won competitions, they got working capital to develop their product. Then, last summer, the two engineers joined with 23-year-old Lindlbauer, who went to Michigan State, and wanted to help promote the company and product, and develop the brand. The three entrepreneurs said they aim to continue to develop and improve their phone cases, invent other products and hire employees through equity options as they grow. So far, they said, they have orders through their distributor for about 100,000 cases, and hope to sell as many as 500,000 by the end of 2015. Their advice for other entrepreneurs: Keep at it.